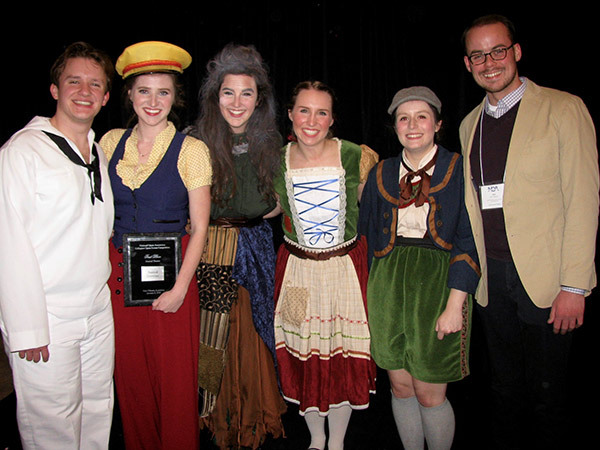 Samford University students won first place in the recent National Opera Association Collegiate Opera Scenes Competition in the Musical Theatre Division with a scene from On the Town. Musical theatre students Reed Hillis and Shelby Terrell played Chip and Hildy in the famous taxi cab duet. “They brought down the house!” according to Kristin Kenning, Samford Opera director. Hillis is a senior musical theatre major from Tyler, Texas, and Terrell is a senior musical theatre major from Nashville, Tennessee. Additionally, Samford was a national finalist in the Opera Division I of the competition with a scene from Hansel and Gretel. Mary Kathryn Evans, Morganne Best and Anna Willis “gave an incredible performance and represented the amazing talent of our students,” Kenning said. Evans is a junior voice major from Charlotte, North Carolina, Best is a senior musical theatre major from Franklin, Tennessee, and Willis is a senior voice major from Birmingham. John Robertson, lecturer and collaborative pianist in Samford’s School of the Arts, played the piano for both scenes. A total of 19 students have competed at the national level over the past five years, and this was the first year Samford had been invited to compete with two scenes at the competition, Kenning added. Samford Opera will return to Birmingham to share opera scenes with local schools during January and will perform their Opera Workshop April 13-14.